Media Registration is now closed. Deadline to apply was Nov. 21, 2018. Scroll down for more information about on-site registration, hours, mandatory photo meeting for on-course credentials, and more. Please contact Tom Boyd with any questions. Credential pick up is at Gerald R. Ford Hall in the Park Hyatt Beaver Creek Resort & Spa. Hours of operation below. 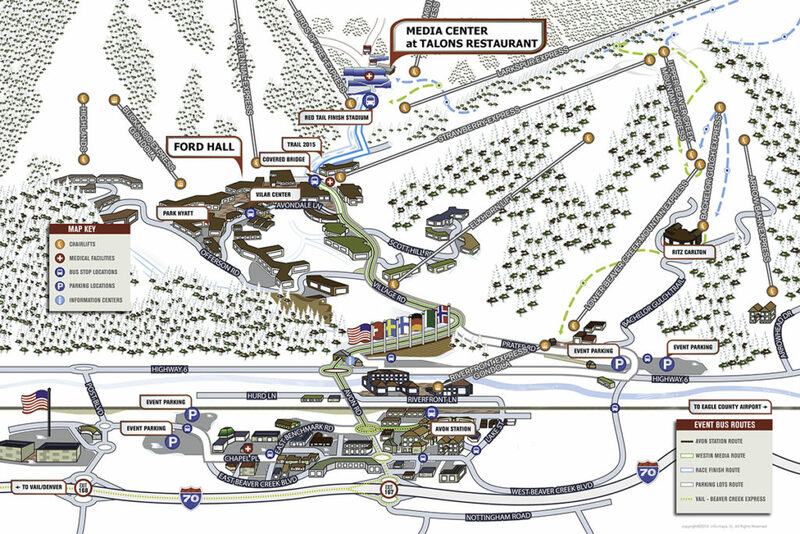 During Birds of Prey, the media help desk is located in the Talons Media Center on Beaver Creek Mountain while the races are taking place and registration is located at Gerald R. Ford Hall in the Park Hyatt Beaver Creek Resort & Spa. The Talons Media Center will be open on active training and race days. If a downhill training day is cancelled, the Talons Media Center will not be open on that day. *Three downhill training sessions are scheduled Tuesday-Thursday, but one of the three is often cancelled. Sunday, Nov. 25: Noon – 5 p.m.
Monday, Nov. 26 – Saturday, Dec. 1: 7 a.m. – 6 p.m.
Sunday, Dec. 2: 7 a.m. – 2 p.m. The photo meeting will be held in Ford Hall at 6 p.m. on Nov. 27. The photo meeting is mandatory for all photographers applying for an on-course credential. The Media Center will have on-site wifi access for accredited members of the media only. Please inquire how to access this network when you pick up your media credential and information packet. Online media kit, including press releases, schedules, editorial-use-only images, maps, audio, and more is available HERE. Kindly notice that all Internet companies’ representatives need to read and fill in the dedicated form before receiving their personal multimedia rights accreditation. The Birds of Prey World Cup will utilize a WhatsApp group to communicate relevant information to media. Accredited media will have the chance to opt in or out of this service at the start of the event. Find event hotel rates by visiting PLAN YOUR VISIT.